Air conditioner motors are some of the crucial components that are required in the operation of the air conditioning in your house. We will discuss the various types of single-phase motors that are used in your equipment at home. Here are four types of electric motors that are commonly being used. This is the simplest design where the RUN winding and START winding are connected in parallel and 90° electrically apart. It is usually used in small pumps, fans and blowers where the capacity is below 1 horsepower. It has a low starting torque but high starting current. Since the torque is low, the ability to start the motor is only practical for low load condition. The RUN winding is make from bigger diameter wire and shorter turn for lower resistance and high inductance properties. The START winding is make from smaller diameter wire for higher resistance and low inductance properties. When power is connected to the motor, both the windings will be energized with the current in the RUN winding lags the current in the START winding by about 30° electrically. This out-of-phase effect on the stator produces a starting torque and causes the rotor to start rotating. Typically the speed of the motor is 1800 rpm or 3600 rpm when running without any load. When the load is connected, the speed can go down to 1725 rpm and 3450 rpm respectively. There is a switch known as centrifugal switch which is connected in series with the START winding. This mechanical switch will open when the motor speed reaches 75% of the rated speed typically within 2 seconds. Once the switch opened, the START winding in circuit is disconnected. This is to protect the START winding from overheating. When the motor is powered off, the switch will close the circuit to get ready for the next starting of the motor. These days, electronic relay is also being widely used to disconnect the START winding. This motor is similar to the split-phase motor except that there is an external capacitor that is connected in series with the START winding. This capacitor will cause the current in the START winding to lead the voltage. The current in the RUN winding lags the voltage. When this happens, the phase difference between the two windings is 90° electrically hence a true two-phase starting is achieved. The starting torque of this motor is very high making it suitable to drive small compressor which needs to start under full load. The capacity of this motor can go up to 1 horsepower. Once the motor has reached 75% of the rated speed, the capacitor and the START winding will be automatically disconnected from the circuit by using the centrifugal swith, potential or current relay. After the capacitor and START winding have been removed from the circuit, the magnetic field being generated continuously will cause the motor to continue running. This type of motor is also known as CSIR motor or Capacitor-Start-Induction-Run motor. 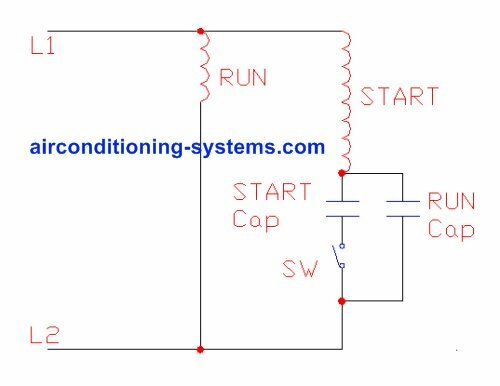 This motor design is similar to the capacitor-start design except that there is a second capacitor known as the RUN capacitor which is connected in parallel with the START capacitor and the switch. These capacitors are effectively connected in series with the START winding. During the starting of the motor, both the capacitors are connected in the circuit. The START winding and the RUN winding will remain connected to the circuit at all times. 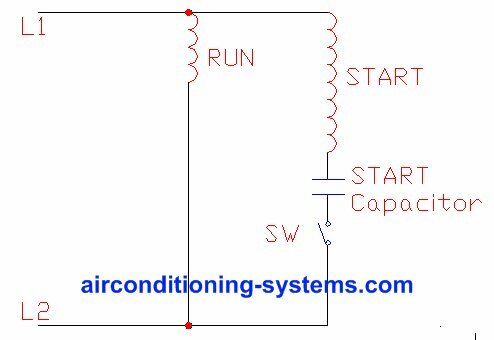 Usually the capacitance of the RUN capacitor is lower than the START capacitor. During starting, the effective capacitance is the combination of both capacitors causing a greater phase angle shift between the windings. This provides a higher starting torque and can be used to drive the compressor as well as in belt-driven motors. As the rotor speed reaches 75% of the rated speed, the switch will be automatically open to disconnect the START capacitor from the circuit. The START winding remains in the circuit. The RUN capacitor helps to correct the power factor of the circuit making it more efficient. The capacity of this type of motor can go up to 10 horsepower and is one of the most efficient motors used in the HVAC industry. This motor has similar design to the phase-split motor except that there is a RUN capacitor connected to the START and RUN windings. This motor does not have any switch and the START winding, RUN winding and the RUN capacitor are active whenever the motor is ON. This type of motor has low starting torque and is suitable to be used in small fan motors such as the fan coil unit of a split air conditioning system. Multi-speed PSC is achieved by changing the winding resistance. If high speed is required, the terminal is connected to the least winding resistance. If low speed is required, the terminal is connected to the highest winding resistance. 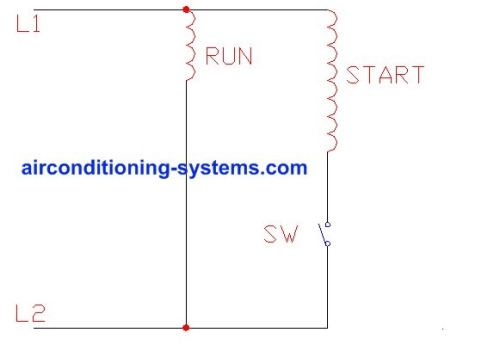 By utilizing relays to choose the terminal to be connected to the line voltage, different speed of fan motor can be achieved. In the diagram above, there are 4 motor speed that can be selected. Super High(SH), High(H), Medium(M) and Low(L). The selection can be done by using electronic relays to connect L2 to one of the four terminals depending on the speed required. See the different types of air conditioner blower or fan that are used in the HVAC equipment. In HVAC, motors are used in fans, compressors and pumps. Get a better understanding of the parameter of the motor and mounting styles. 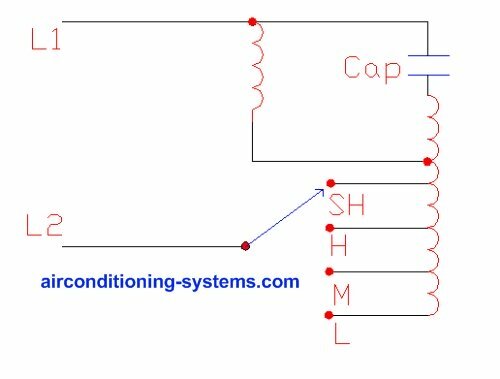 Read the different types of capacitors used in a air conditioner circuit.